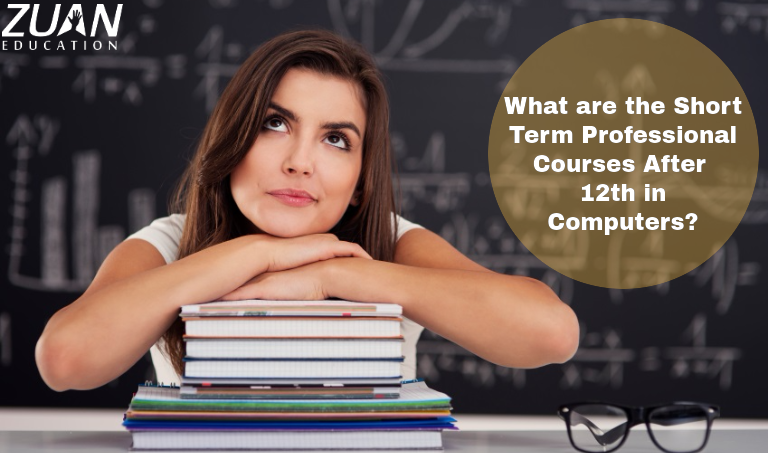 What are the Short Term Professional Courses After 12th in Computers? Hey there! I know you have got a question… it is about the short term professional courses after 12th. Isn’t? Of course, there is this long term course you shouldn’t miss- Your UG degree course! You should get through your college entrance exams. Then get an undergraduate degree, become a post graduate. Get a job, have a pay rise. And settle down finally! As you could see it, your 12th standard is merely a beginning. And you have got a long way to go. With so many graduates and postgraduates clustering around, it is hard to achieve the desired success. So if you want to stand out in the crowd, you should start updating your skills and enhancing your CV. Wondering how to do it? Well, with a few short term professional courses after 12th board exams, you will realize that you are well ahead of your peer group. Now, don’t worry if you have no clue as to where to start. I have got your back. I have come with a list of Five Short Term Professional courses after 12th Standard to get you started. Basically, this list contains computer courses. Most of the Indian institutes that offer these courses offer them without any prerequisites. Nonetheless, I have given links to our course pages to help you decide better. You might be wondering what digital marketing is, and why it is necessary for you to learn it. Well, digital marketing is the promotion of products, brands, and services through digital media. The internet keeps spreading widely and deeply. The number of adult users is also increasing as days go by. As a result, the way people shop has also changed along with it. Online shopping has indeed taken the business world by storm. There is a paradigm shift here– the emphasis on the marketing moved from the traditional method to its digital counterpart. So, if there is a right time for you to start thinking seriously about digital marketing, then this is it! There are a number of career options and job placements in India as well as foreign countries. All you need to do is equip yourself. You can do the course in any of the well-recognized and the popular training institutions in Chennai. Or take a look at our course page to see what our digital marketing course has to offer people in general. Digital marketing has a strong future, so invest your time properly. Microsoft needs no introduction. The All-in-One Microsoft Office Suite is used globally in almost every field. It is in great demand! But how many of you can claim to have adequate knowledge of all of the available Microsoft Office tools? Word, Excel, Powerpoint, OneNote, and Outlook… the list is no joke! You need it to get a decent job. So if you don’t possess the skill, it is high time you learn MS Office. SEO, or Search Engine Optimisation, is a happening field. It is the method of improving the quality of visits to a website in a search engine. It will be interesting to learn the different ways in which search engines work. Since every major company relies on digital marketing, the demand for a skilled SEO professional is also increasing. An SEO professional is required to help a business increase its revenue through online marketing. The right training will help you discover the SEO specialist in you. Not sure whether this is your cup of tea? Wait till you check our SEO Training web page. Web designing is an interesting field to work in. Similar to the other designing we have heard of, like for instance, interior designing and fashion designing, Web designing also believes in giving an aesthetic and creative twist to the otherwise boring canvas. If you think that you might enjoy designing and maintaining websites, you should probably enroll for a course on Web Designing. A qualified and skilled web designer earns a good payscale. If you think that your interest lies rather in the creation part, you can give the Web Development training a try. It is a short term job oriented course, and am sure you would love it! If you are dreaming of a career in the software field, programming languages are a must. You would have learned the basics of the C language in your school. But that is not sufficient. With computers getting smarter with time, the programming language should also get refined in order to communicate with them. It is recommended that you start doing a course on c and c++. However, you should remember that C and C++ may not seem worthy when they are by themselves. Make sure you move further and explore the advanced level programming languages like Java to enhance your CV. You can check out our webpage on Java course, short term course that could boost your career, to learn more about it. Although there are several diplomae and certificate courses around us, these five Short Term Professional Courses After 12th are handpicked to ensure your good user experience. With computers and the internet, there is hardly anything that you cannot do with them these days. That would mean wider job prospects. A course completed certificate from a recognized training institute would help you get placed very easily. If you think that you don’t have sufficient computer knowledge to get started with these Short Term Professional Courses After 12th, you can begin by doing our basic computer course. Computers exist almost everywhere; education, trade, airport, management, finance, human resource, healthcare sector, and the list goes on. Moreover, India is getting digitalized– from urban to even the rural areas. Hence, basic computer knowledge is no more an additional skill now; it has become one of the necessities of life.